The theory of constraints is an approach to production planning and control that emphasizes on the constraints to increase throughput by effectively managing constraint resources. One application in theory of constraints is product mix decision. Product mix influences the performance measures in multi-product manufacturing system. This paper presents an alternative approach by using of goal programming to determine the product mix of the manufacturing system. The objective of paper is to provide a methodology in order to make product mix decision. Key point of the proposed methodology is considering decision maker idea to determine the weights of objective functions that are throughput and bottleneck exploitation. Therefore the weights of the objective functions are determined by the information get from decision maker. Through an example, inefficiency of theory of constraints in multiple bottleneck problems has been showed. Comparison of theory of constraints, linear programming and other methods to product mix problem has also discussed to show the advantages of the proposed method. Aguilar-Escobar, V., Garrido-Vega, P. and González-Zamora, M., (2016). 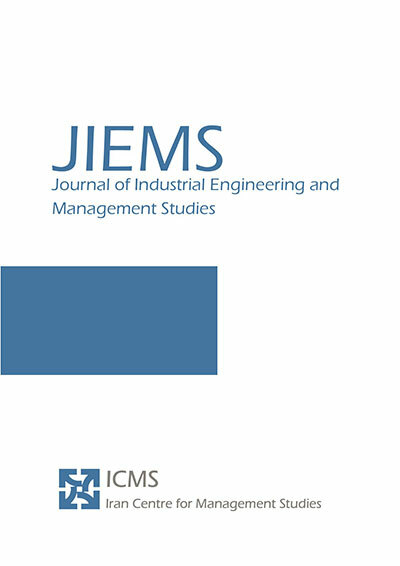 “Applying the theory of constraints to the logistics service of medical records of a hospital”, European Research on Management and Business Economics, Vol. 22, No. 3, pp 139-146. Badri, S. A. and Aryanezhad, M.B., (2011). “A Mathematical Method for Managing the System Constraint”, International Journal of Engineering (IJE) , Vol. 24, No. 1, pp 37-47. Balakrishnan, J. and Cheng, C.H., (2000). “Theory of constraints and linear programming: A re-examination”, International Journal of Production Research , Vol. 38, No. 6, pp 1459–1463. Bhattacharya, A. and Vasant, P., (2007). “Soft sensing of level of satisfaction in TOC product mix decision heuristic using robust fuzzy-LP”, European Journal of Operation Research , Vol. 177, 55–60. Bhattacharyal, A., vasant, P., Andreeski, C., Barsourn, N., kolemisevska, T., Dinibiitiin, A. T.,and Dirnirovski, G. M., (2006). “decision making in TOC product mix selection via fuzzy cost function optimizations”, Improving Stability in Developing Nations through Automation Prishtina, Kosovo. Coman, A. and Ronen, B., (2000). “production outsourcing: a linear programming model for the theory of constraints”, International Journal of Production Research , Vol. 38, No. 7, pp 1631–1639. Goldratt, E.M., (1990). “What is This Thing called Theory of Constraints”, North River Press, NewYork. Golmohammadi, D., (2015). “A study of scheduling under the theory of constraints ”, International Journal of Production Economics, Vol. 165, pp 38–50. Finch, B.J. and Luebbe, R.L., (2000). “Response to Theory of constraints and linear programming: A re-examination”, International Journal of Production Research , Vol. 38, No. 6, pp 1465–1466. Frendall, L. D. and Lea, B. R., (1990). “Improving the product mix heuristic in the theory of constraints”, International Journal of Production Research , Vol. 35, No. 6, pp 1535–1544. Georgiadis, P., & Politou, A., (2013). “Dynamic Drum-Buffer-Rope approach for production planning and control in capacitated flow-shop manufacturing systems”, Computers & Industrial Engineering, , Vol. 65, No. 4, pp 689-703. Hasuike, T. and Ishii, H., (2009). “product mix problems considering several probabilistic conditions and flexibility of constraints”, computers and industrial engineering , Vol. 56, pp 918-936. Hsu, T. C. and Chung, S.-H., (1990). “The TOC-based algorithm for solving product mix problems”, Production Planning and Control t”, Vol. 9, 36–46. Izmailova, A., Kornevaa, D. and .Kozhemiakinb, A., (2014). “Effective Project Management with Theory of Constraints”, Procedia - Social and Behavioral Sciences, Vol. 229, pp 96–103. Lee, T.N., Plenert, G., (1993). “Optimizing theory of constraints when new product alternatives exist”, Production and Inventory Management Journal , Vol. 34, No. 3, pp 51–57. Linhares, A. (2009). “Theory of constraints and the combinatorial complexity of the product mix decision’, Int. J.Production Economics, Vol. 121, pp 121–129. Luebbe, R. and Finch, B., (1992). “Theory of constraints and linear programming: A comparison”, International Journal of Production Research, Vol. 30, No. 6, pp 471–1478. Mishraa, N., Prakash, Tiwari, M.K., Shankar, R. and Chan, F.T.S., (2005). “Hybrid tabu-simulated annealing based approach to solve multi-constraint product mix decision problem”, Expert Systems with Applications , Vol. 29, pp 446–454. Okutmu ¸E ., Kahveci, A., Kartašova , J., (2016). “Using theory of constraints for reaching optimal product mix: An application in the furniture sector”, Intellectual Economics , pp 138–149. Onwubolu, G.C. and Mutingi, M., (2001). “A genetic algorithm approach to the theory of constraints product mix problems”, Production Planning and Control , Vol. 12, No. 1, pp 21–27. Onyeocha, C., (2015). “Effect of product mix on multi-product pull control Chukwunonyelum Emmanuel Onyeocha”, Simulation Modelling Practice and Theory, Vol. 2, pp16–35. Plenert, G., (1990). “Optimizing theory of constraints when multiple constrained resources exist”, European Journal of Operational Research, Vol. 70, pp 126–133. Rabbani, M., & Tanhaie, F. , (2015). ” A Markov chain analysis of the effectiveness of drum-buffer-rope material flow management in job shop environment”,growing science , Vol. 6, No. 4, pp 457-468. Ray, A., Sarkar, B. and Sanyal, S.K., (2008). “An improved theory of constraints”, International journal of accounting and information management , Vol. 16, No. 2. Ray, A., Sarkar, B. and Sanyal, S., (2010). “The TOC-Based Algorithm for Solving Multiple Constraint Resources”, International Jo IEEE Transactions on Engineering Management, Vol. 2. Tanhaei, F., & Nahavandi, N., (2012). “Algorithm for solving product mix problem in two-constraint resources environment”, The International Journal Of Advanced Manufacturing Technology , Vol. 64.